As I mentioned a week back, I’ll be taking a vacation from the Strang Institute starting April 1st to work on a pretty big project for the next three weeks. Fear not, dear readers, that there will be nobody on hand to upload Ellie’s adventures for you to see. I’ve made arrangements with six super fantastic cartoonists to sit in my chair while I’m off. They’ve all got their security clearance and the first strip will arrive Monday. Now, about this strip. I was inspired by two things. One is a passage from Carl Sagan’s book Pale Blue Dot. There’s a cool comic version by cartoonist Gavin Aung right here. And two, this video called Overview, which you can watch below. Thanks again, all of you, for continuing to read Ellie’s adventures. I’ll be back April 22nd! What a gorgeous Strip James! James you always amaze me with your art! Love the colours and the shadows, Jim! 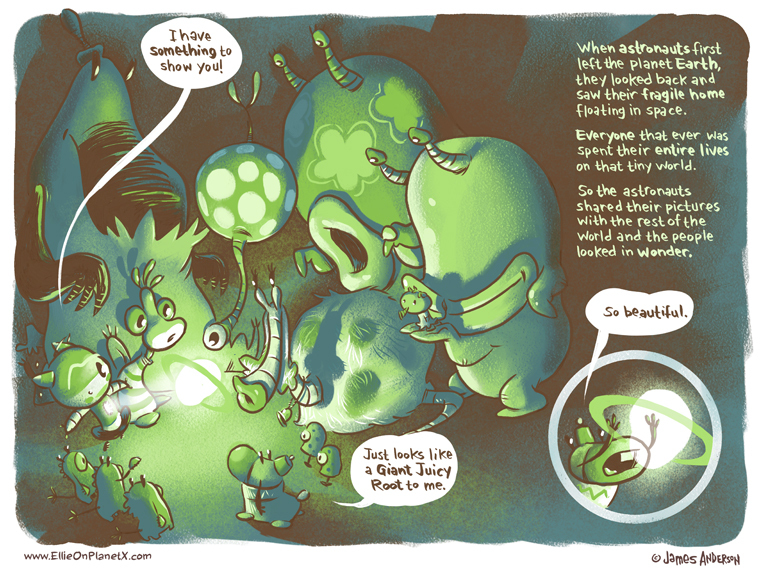 Another beautiful strip worthy of a giclee poster! Nice light and shadow work.